New Zealand Test batsman Ross Taylor proved an immovable rock at the Nevill Ground hitting an unbeaten 142 as Sussex were dismissed for 333 on a day of cut and thrust under the sun. Kent will go into the final day of this Specsavers County Championship clash holding a 242-run lead and with the option to enforce the follow-on and push for their third win of the Division 2 campaign. But it was the former Blackcaps Test skipper, Taylor, who batted a shade under six hours on the hottest day of the year who made Kent work hardest. In praise of his team-mate’s work ethic, Sussex opener Chris Nash, said: “Ross has been brilliant for us in all formats. He’s won three T20s for us off his own back and in four-day cricket he’s shown tremendous application. As for his early morning battle with Kent’s South Africa paceman Kagiso Rabada, who looks set to extend his battle with Taylor in the Test arena later in the month, Nash added: “He tested us all with the new ball, hit good areas and extracted everything he could out of the new ball and a pretty dead pitch. Rabada, who bagged three for 81 on the fairly lifeless Nevill pitch, said: “A lot of the guys are exhausted, that was a hot day wherever you might be in the world. “We fought very hard and tomorrow we’ll be looking to finish these guys off. There’s a bit of turn for the spinners, and some footmarks, so hopefully they can create problems. “This has been a magnificent effort by the team and everyone bowled well today and played their part. We’re giving it our best shot and even though some complained about the heat, it was all in good spirits, it was all banter. Taylor teamed up with England T20 star Luke Wright to add 114 in 34 overs either side of lunch before Rabada broke the stand with the second new ball. Swishing outside off stump and on the back-foot, Wright edged to Kent’s stand-in keeper Callum Jackson to make it 219 for four. Ben Brown sidled out but, with his score on five, proffered no shot to a Rabada length-ball to go leg before and give the 21-year-old his third wicket. Just before a delayed tea, Chris Jordan (7) lent back aiming to force one from Darren Stevens through the covers only to edge to James Tredwell at second slip. Six wickets down at tea, Sussex did their utmost to bat out the session, losing their last man in the final over of the day. 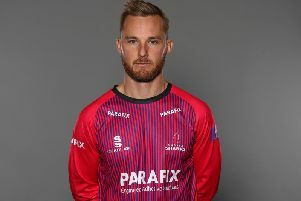 Will Beer was run out by a direct hit by Stevens from mid-off and, after taking a fearful blow on the helmet from a Rabada bouncer, Danny Briggs was caught behind off James Tredwell who, together with Imran Qayyum, polished off the innings with lbw decisions. Having resumed on their overnight total of 69 for one – a first innings deficit of 506 – Sussex suffered their first casualty of the day after half-an-hour when Nash fell for 55. Moments after posting a 128-ball 50 with nine fours, the veteran right-hander was pinned on the back foot by a Rabada off-cutter that appeared to keep low. Indian umpire Virendra Sharma, officiating in the game as part of an ECB exchange scheme, duly raised his finger for the first time in the match. Rabada was rested after a morning stint of 5-3-7-1 and replaced at The Pavilion End at The Nevill Ground by Mitch Claydon. He struck in the 51st over to remove Luke Wells for 22. Looking to square drive, the youngster found a thick inside edge to drag the ball onto his own leg stump.